Dated transit thinking comes from SkyTrain, because light-metro is a dated transit system. There is no backbone for transit, except for a network of transit lines and only if it is designed properly, designed for the needs of its customers and not the electoral needs of politicians. One $2.95 billion SkyTrain does not a backbone make. Oh, please excuse me, this is Metro Vancouver and Transit is planned and built to suit the needs of politicians as it gives them something to cut ribbons at election time. As for transit customers, well they can go to hell and riding TransLink’s product for them is hell. Only seven such systems built in 40 years. As for backbone, the Mayor of Surrey has none, he doesn’t even have the backbone to understand the science of modern public transport and wants transit, that is so, so 1970′s. 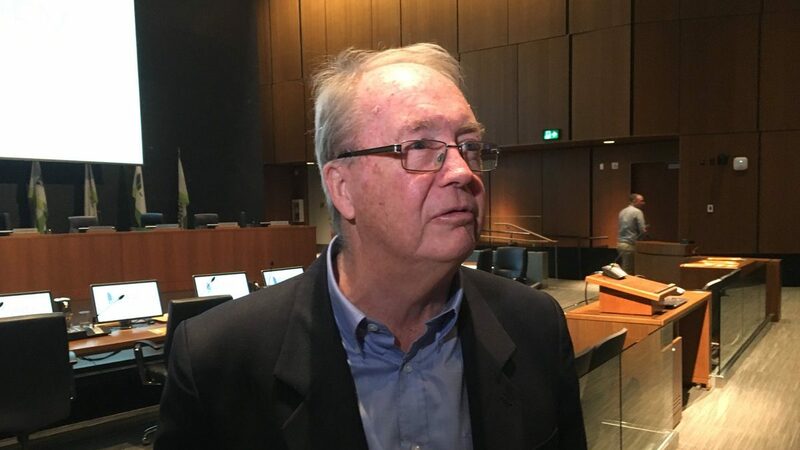 SURREY (NEWS 1130) – Surrey’s mayor is once again justifying his stance on building out the SkyTrain network in that city versus an LRT alternative. Doug McCallum took questions about the plan following Monday night’s council meeting. He says the first step is building a “backbone,” which would be done in two distinct phases. “You do a backbone first, which is Fraser Highway from City Centre to Langley and from City Centre to Newton then to South Surrey. That’s the backbone,” he explained. McCallum says that is the 10-year plan. NEWS 1130 spoke with commuters outside Surrey Central, one of the busiest SkyTrain stations in the system, about McCallum’s plan. Another commuter said cities are getting bigger and quick links between them will be necessary. “Look at Surrey. Five years ago, we were ‘just Surrey.’ But now we’re becoming ‘The City of Surrey’ because there are towers going everywhere,” he said. “Langley and White Rock … pretty soon, we’re going to need transportation to get down there,” he added. According to McCallum, city staff is already doing what it can to ensure SkyTrain becomes a reality, including exploring 24-hour construction to speed up the process. Last week, the TransLink Mayors’ Council voted to suspend the Surrey LRT project, including all spending. About $50 million has already been spend on planning for light rail. The city had also spent $20 million in pre-construction work. However, although the LRT project is on hold, the Mayors’ Council is not yet pursuing SkyTrain. An analysis will be done on SkyTrain south of the Fraser, with a report expected next month. I will show you this photo of a switch heater on the Confederation Line. One of the reasons the Skytrain technology has issues during certain times of the night and sometimes during the day, in places like Toronto, or any place that has a large number of days below 0 degrees Celsius is that ,the whole length of 4th rail (induction reaction rail) over the entire network, not just at track turnouts (switches), requires the surface of the rail to be heated to a point around 5 degrees Celsius. Note on the picture this is heater #317. So a standard gauge LRT system of 12.5 km and no induction reaction rail, still requires dozens, may be even a hundred or more of these heaters in our climate. This is one of the many, many small reasons Skytrain is so expensive to put in. Zwei replies: so many problems, but with the LIM being 1 CM above the reaction rail is also a very big problem. In the late 80′s, during a rare heavy snowfall, they used a car to ram through a drift, the problem was that the compacted snow under the LIM actually derailed the train. As this happened after revenue hours, it incident remained hush hush. There is no dated mayor and no dated thinking. Light metro is not dated. Light metro includes automated metros llike skytrain and LRT. Light metro is for smaller cities that can’t afford or need a full metro. LRT is a light metro. Metro Vancouver has a population of about 2.5 to 3 million. Toronto has about 5-6 million. London, England and Hong Kong has about 8 million. Tokyo, Japan is 9-10 million. All these cities except Vancouver have a full metro. Vancouver is a medium size city. A light metro is about right fit. Zwei replies: Light metro was made obsolete by modern LRT and the examples you have listed are merely demonstration lines of a particular proprietary transit system. By the way, SkyTrain has less capacity than LRT and it seems to me light rail would be the right fit.